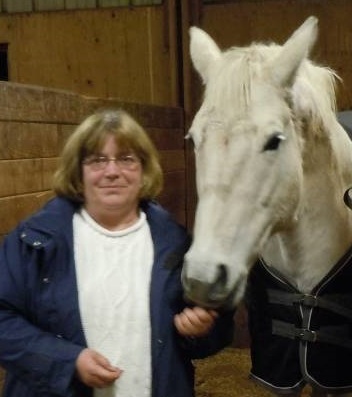 AHP Affiliation: Joined as an individual member in 2007, became a member with the Oregon Thoroughbred Owners and Breeders Association in 2012, and resumed her individual membership in 2018. Education: Bachelor’s degree in communications from Illinois State University, and Health Information Management. AHP: How did you get involved in equine media? KO: At age 35, I started learning to ride at a training barn and got my first horse at age 40. When my family moved from California to Washington we bought a home with five acres. I was thrilled to keep my horse at home. I relied on equine magazines like Practical Horseman, Equus and Horse Illustrated for do-it-yourself guidance, but I still made mistakes. Thinking that other new residents might have the same problems I was having, I volunteered with the Washington State University Small Acreage Program. With the training I received there, I opened my farm as a boarding stable for retired show horses. I also started writing for Flying Changes, the Northwest Sport Horse magazine, and hosting small farm tours of my property. Since 2012, I’ve worked for Classic Equine Equipment producing two blogs per week, a monthly newsletter and social media posts. The Oregon Thoroughbred Owners and Breeders Association hired me as its communications coordinator in 2012. I worked there until 2017. Finally, through an AHP [Newsgroup] post in 2016, I learned about a job opening as a public relations writer with JRPR Equine News Room for its clients at the Winter Equestrian Festival. When I applied, I was sure to mention that I was an AHP member, and I think that helped me get the job. AHP: What project in equine media are you most proud of and why? KO: Serving on the board of directors at the Oregon Thoroughbred Owners and Breeders Association. They wanted a magazine, a social media presence, a routinely updated website, event coverage and a monthly e-newsletter. Starting from scratch with a limited budget, we successfully put together an integrated communication plan that was well-received by the board and members. AHP: How did you hear about AHP and what made you decide to join? AHP: What are the biggest benefits of AHP to your business? KO: My career in equine media has been long and circuitous. My AHP membership has helped me build on my experience in other industries to do what I love–write to educate horse people. I believe that I wouldn’t have received Classic Equine Equipment, Oregon TOBA or JRPR without mentioning that I was an AHP member in my resume. I think it’s that something extra that helps you stand out when job hunting. AHP: How do you make the most of your membership? KO: I continually check the AHP CareerTrack listings on the website for new opportunities. But it’s the online news releases that help me the most. As a blogger, I’m always looking for issues to write about. Checking the news releases give me tons of ideas. For example, US Equestrian published a news release a few months ago on their Safe Sport program. I thought it had to do with wearing helmets and vests when jumping. After learning about potential harassment in our sport, I quickly wrote a blog to educate other horse people in hope of getting the word out. It’s not always possible to attend the annual conferences, but I did attend the one in Albuquerque, New Mexico, in 2007 and thought it was fabulous. With this year’s also in Albuquerque, I certainly hope I can attend and learn even more!